When it was finished, I loved it immediately, and as I was going home I thought about what more I could do with it. So, the plan now is more bands in different widths above and below the current band. 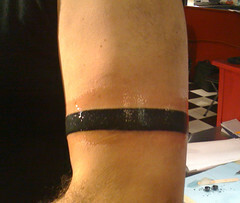 When those are done, I’ll consider adding something else in-between the bands. Elegant. The mother in me wants me to urge you to not get carried away. Remember, old people with tatoos! Ugggh. Heh, I've had a few friends go far more 'mother' than that. Finger wagging, “You didn't get my approval” etc. If I end up an old person covered in tattoos, so be it. I love this band, and I know exactly where I'm taking it from here. It's going to be a very large piece of work when I'm done, and be on more than just my arm. a VA home for sailors, then. I am NOT telling/urging/begging you not to do it. Just look. is plenty else in one's life to regret (I am the queen, here). is plenty else in one’s life to regret (I am the queen, here).